When introduced into F1 in 1971, the Lotus 56 had been presented by Maurice Philippe in 1968 to compete in the Indianapolis 500. With its innovative turbine drive, instead of a normal reciprocating piston engine, F1 designer Colin Chapman saw the potential of such a car and let the project run slowly for two years. However in 1970, Chapman got in contact with Pratt & Whitney which could provide a turbine to meet the regulations of Formula One. The result is the Lotus 56B that was determined to run in the 1971 Formula One season. The new turbine driven car had several important differences compared to traditional power. Most importantly, the turbine had about 600hp compared to 425hp of the traditional engines at these days. Furthermore, the drive train was simpler as the car did not need a gearbox or clutch to get all the power to the wheels. A turbine engine is also smaller and lighter than a regular piston engine, meaning less moving parts (more on gas turbines can be found at how stuff works). Rather than radiator openings in the sidepods, the car featured a chimney behind the driver's head to evacuate the hot gases from the turbine engine. As the turbine engine was very thirsty, the extra space in the sidepods was all used up by large fuel tanks that could hold up to 280 liters of kerosene. Additionally, the lack of engine brake meant the drivers had to rely solely on the regular brakes. The car was therefore equipped with larger and heavier inboard brakes while the drivers had to get used to left foot braking, a little known technique at the time. The turbine concept nearly proved good enough for a GP win when in the flooded circuit of Zandvoort, Australian Dave Walker moved up during the race from a back row starting position. He occupied the tenth position after five returns and made returns faster than the leaders Jacky Ickx and Pedro Rodriguez. Convinced of the possible victory, Chapman was left disappointed after Walker slid off the circuit and had to retire. The 56B participated in 2 other GP's, performing poorly in Silverstone and finishing 8th in Monza. In spite of the plans to construct a smaller and lighter version, the Lotus 56B was the last turbine driven car in Formula One. 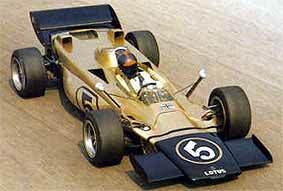 Although originally raced in Gold Leaf livery its last outing was in the gold/black livery of World Wide Racing in which the sole version ever built still exists.